A bird standing on a buoy in the water with wings spread. I know in an objective reality that this is a bird. But I still see a dragon and I can't unsee it. And it's moments like this that make me wonder about the nature of dragons and how so many different civilizations, unconnected, came to visualize and include dragons as part of their lore. I can imagine seeing such things off in the distance and wondering whether it was beast or fowl. 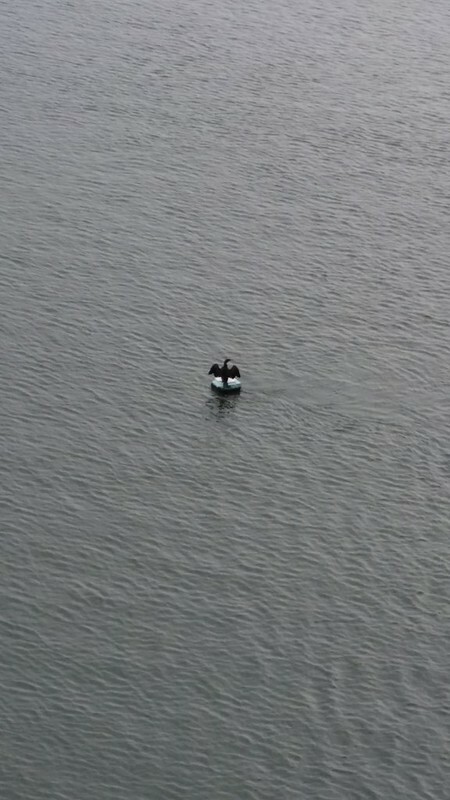 That this creature is standing on a buoy in the middle of a river between Salem and Beverly means it is most definitely a bird, but idle fantasies while traversing a bridge is a very hard habit to break. Within this photo, I also appreciate how lonely the dragon/bird looks when surrounded by so much water. The photo denotes a sense of isolation, which makes sense for a dragon.